For children facing stressful situations,”can be a comforting reminder that someone cares. 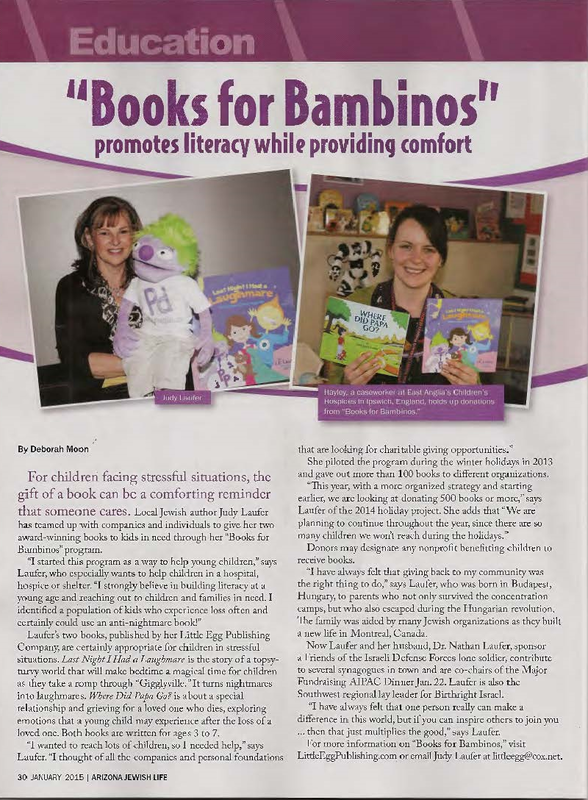 Local Jewish author Judy Laufer has steamed up with companies and individuals to give her two award-winning books to kids in need through her “books for bambinos” program. Laufer’s two books, published by her Little Egg Publishing Company, are certainly appropriate for children in stressful situations. Last Night I Had a Laughmare is the story of a topsy-turvy world that will make bedtime a magical time for children as they take a romp through Gigglyville. It turns nightmare into laughmares. Where Did Papa Go? is about a special relationship and grieving for loved ones who dies, exploring emotions that are young child may experience after the loss of a loved one. Both books are written for ages 3 to 7. She piloted the program during the winter holidays in 2013 and gave have more than 100 bucks to different organizations. Donors may designate any nonprofit benefiting children to receive books. “I have always felt that giving back to my community was the right thing to do,” says Laufer, who was born in Budapest Hungary, the parents who not only survived the concentration camps, But will also escape during the Hungarian revolution. The family was aided by many Jewish organizations as they built new life in Montréal Canada. Now Laufer and her husband, Doctor Nathan Laufer, sponsor eight friends of the Israeli Defense Forces Lone Soldier, contribute to several synagogues in town and are cochairs of the Major Fundraising AIPAC Dinner Jan. 22. Laufer is also the Southwest regional lay leader for Birthright Israel. “I have always felt that one person really can make a difference in this world, but if you can inspire others to join you… then that just multiplies the good,” says Laufer. Author: Deborah Moon, Jewish Life Magazine.